Earlier this week, we ranked the top cornerbacks in the NFL, and with our secondary rankings also dropping, it makes sense that we do the same with safeties too. Some are ballhawks who can patrol the middle of the field while others cause havoc near the line of scrimmage. The top three made the PFF50 earlier this offseason, but here is a full breakdown on the top 10 safeties in the NFL heading into the 2018 season. The obvious choice at number one, Smith was the best safety in the NFL in 2017, and in the conversation for best player in the league full stop. His 97.0 PFF grade was a career high, but he has produced an elite grade of 90.0 or higher in three of the past four seasons. 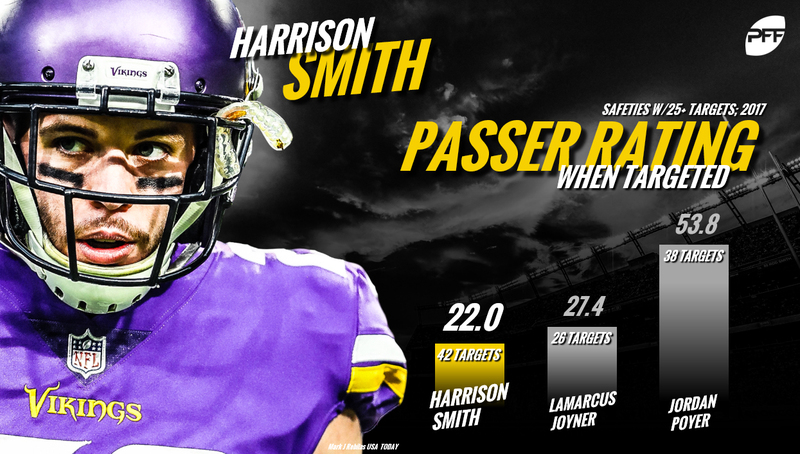 Smith was targeted 42 times in primary coverage, allowing zero touchdowns and coming away with five interceptions and five pass breakups, resulting in an NFL passer rating allowed of just 22.0, the lowest of any safety who was targeted at least 15 times. 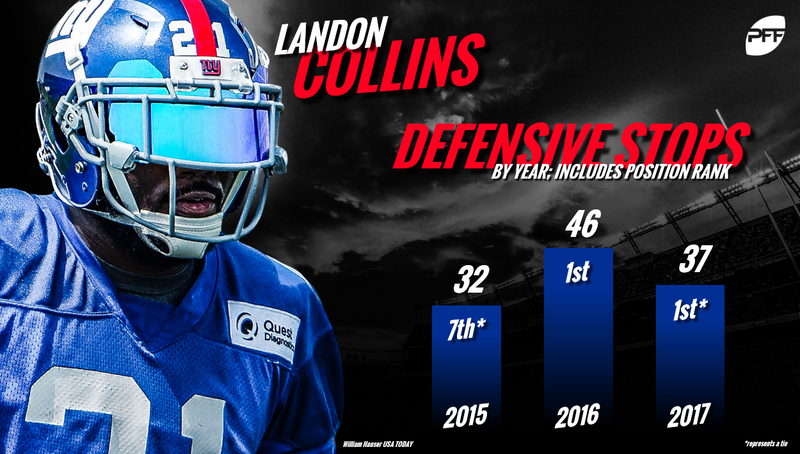 Collins really struggled as a rookie, finishing the year with a PFF grade of 42.5, so when the former Alabama defensive back produced an elite 92.5 grade in 2016 we wanted to see how he would follow it up. At 88.5, his 2017 PFF grade wasn’t quite as high as the year before, but was a good way of confirming his place among the elite safeties in the NFL. Collins delivers against both the run and pass, and is the only safety in the NFL who can claim to have produced a PFF grade of 80.0 or higher in each of the past two seasons both in coverage and in run defense. The prototypical center fielder at safety, Thomas has been the subject of much speculation about his future in Seattle this offseason. While that may be in doubt, his place among the top safeties in the league is not. With range like few other safeties in the NFL can boast, Thomas has racked up 27 interceptions and 26 pass breakups since entering the league in 2010, and has produced a PFF grade of 84.6 or higher in each of the past five seasons. Superstars have come and gone from the New England Patriots defense, but McCourty has been ever present since being drafted with the 27th overall selection in the 2010 NFL Draft. Initially a cornerback, the former Rutgers star moved to safety during the 2012 season and has been dominant ever since. Over the past six years he has produced an elite PFF grade of 90.5 or higher three times, and always at 82.6 or higher. 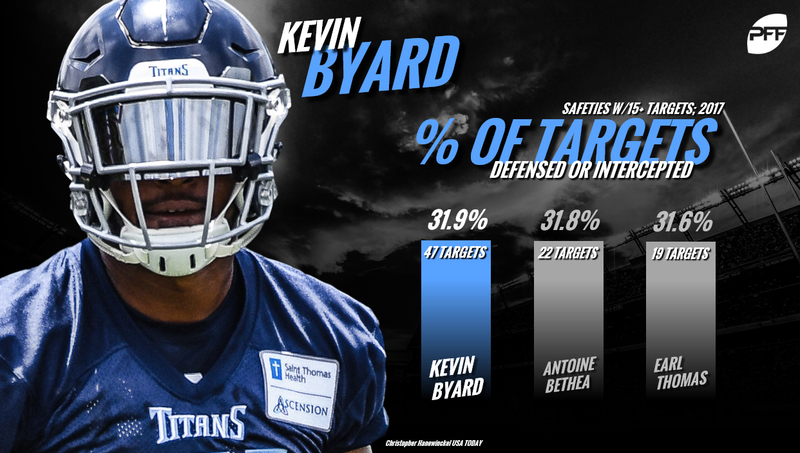 A 2016 third-round draft pick out of Middle Tennessee State, Byard took over as the Titans starting free safety midway through he 2016 season and has yet to look back. While he looked good late in 2016, it was last season where he really took a step forward, showcasing his playmaking ability with eight interceptions and seven pass breakups in coverage. Were this purely based on 2017 play, Joyner would be higher on the list, but factoring in sample size suggests that we should be cautious on what to expect from Joyner. That being said, the level of play we saw from him for most of the 2017 season was fantastic, and through four seasons with time spent at both safety and in the slot, Joyner has allowed just three touchdowns from 206 passes thrown into his coverage. Amos is another player who performed at an elite level in 2017, impressing both in coverage and against the run. He missed just six tackles over the course of the regular season, while his 26 tackles resulting in a defensive stop ranked 15th among safeties. 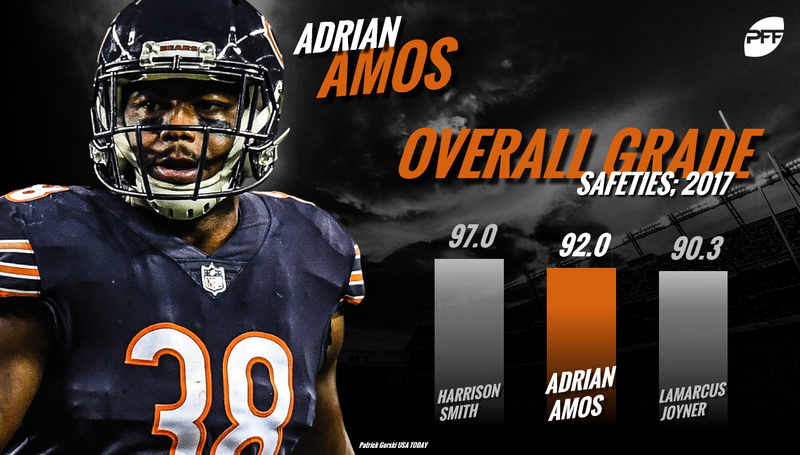 Producing a PFF grade of 92.0, Amos vaulted himself into the upper echelon at the position and we can’t wait to see how he follows it up in 2018. A nine-year veteran after being drafted by the Houston Texans in the fourth round out of New Mexico in 2009, Quin has found his perfect fit in Detroit. Delivering the highest-graded season of his career at 89.0, he tied with Byard for the fourth-highest grade at the position last year. Quin excelled against the run and in coverage, allowing just 113 yards from the 23 plays where he was targeted in primary coverage. 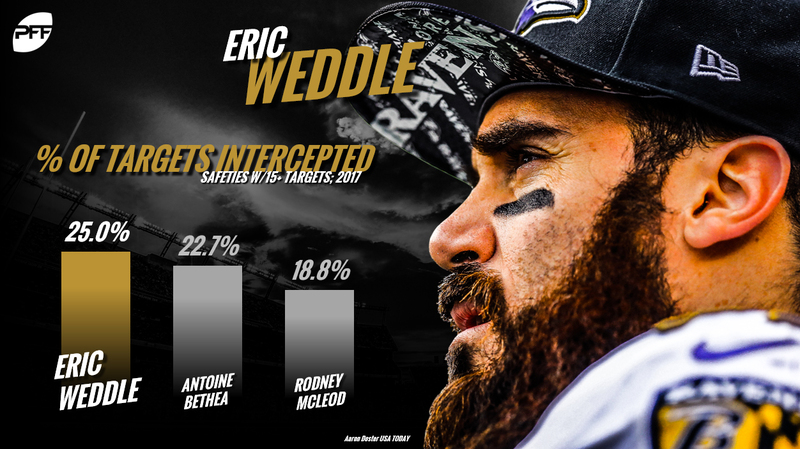 The elder statesman of our top safeties, Weddle had some struggles with tackling early in 2017, but rebounded to finish the year strong. After missing seven tackles through the first six games of the year, he proceeded to miss just three over the next 10 games. His PFF grade reflected that improvement in the second half of the year, with Weddle ranking as our eighth-highest graded safety in that span. The 14th overall selection in the 2009 NFL Draft, Jenkins performance improved dramatically when he joined the Philadelphia Eagles in 2014, with his ability to play safety and cover from the slot helping him to excel. His PFF grade in New Orleans didn’t rise above 78.0 from 2009 to 2013, but since joining the Eagles his grade is yet to dip below 80.8.